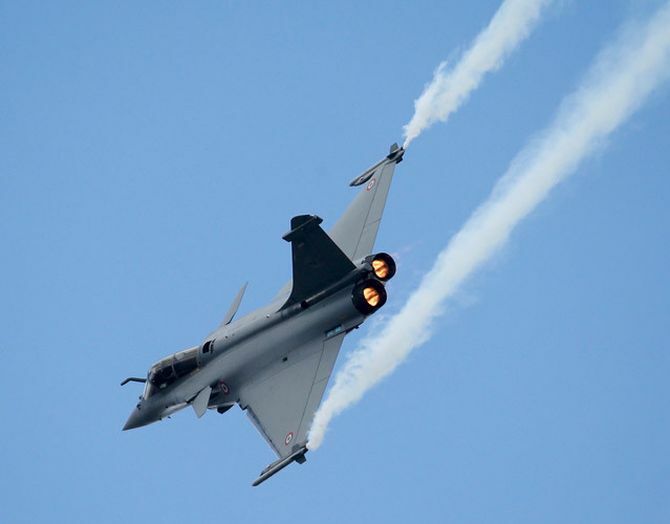 India and France on Monday inked an Inter-Governmental Agreement on the sale of 36 French fighter jets, Rafale, but were unable to sign the final deal due to some “financial” aspects, which are expected to be sorted out in “couple of days”. This agreement was among the 14 pacts signed between the two countries after extensive talks between Prime Minister Narendra Modi and visiting French President Francois Hollande which focused ways to enhance cooperation in counter-terrorism, security and civil nuclear energy. “Leaving out financial aspect, India and France have signed Inter-Governmental Agreement on purchase of 36 Rafale fighter jets. We expect that even the financial aspects pertaining to purchase of Rafale jets will be resolved as soon as possible,” Modi said at a joint press event with Hollande. Terming the signing of the IGA as a “decisive” step, the French president said there are some financial issues that will be sorted out in “couple of days”. The two countries are in negotiations for 36 Rafale fighter jets in fly away conditions since the announcement for the deal was made by Modi in April during his visit to France. However, the final deal is yet to be sealed as both sides are still negotiating the price which is estimated to be about Rs 60,000 crore. A high-level team from France is here and carrying out last minute negotiations. Apart from defence cooperation, the talks between the two leaders primarily focused on ways to boost counter-terrorism cooperation in the aftermath of attack in Paris in November last and Pathankot terror strikes earlier this month. “From Paris to Pathankot, we saw the gruesome face of the common challenge of terrorism... I also commend the strength of your resolve and action these terrorist attacks. President Hollande and I have agreed to scale up the range of our counter-terrorism cooperation in a manner that helps us to tangibly mitigate and reduce the threat of extremism and terrorism to our societies. “We are also of the view that the global community needs to act decisively against those who provide safe havens to terrorists, who nurture them through finances, training and infrastructure support,” Modi said. The two countries reiterated their call for Pakistan to bring to justice their perpetrators and the perpetrators of the November 2008 terrorist attacks in Mumbai, which also caused the demise of two French citizens, and to ensure that such attacks do not recur in the future, a joint statement issued after the talks said. “Daesh has attacked us. The Islamic State is provoking us but we are determined to take the right decision. We will strike them time and again those who kill our children. I would like to thank you for the support in dire circumstances. France will never forget. We have decided to strengthen our cooperation against terror,” Hollande said. The two sides resolved to step up their joint effort to counter violent extremism and radicalisation, disrupt recruitment, terrorist movements and flow of Foreign Terrorist Fighters, stop sources of terrorist financing, dismantle terrorist infrastructure and prevent supply of arms to terrorists. “To this end, they committed to further develop exchanges in the fields of intelligence, finance, justice and police. They welcomed the strengthening of the cooperation between Indian and French counter terrorism authorities and units, in particular between their cybersecurity experts,” the joint statement said. Stressing that terrorism cannot be justified under any circumstance, regardless of its motivation, wherever and by whomsoever it is committed, Modi and Hollande pitched for decisive actions to be taken against Lashkar-e-Tayiba, Jaish-e-Mohammad, Hizb-ul-Mujahideen, Haqqani Network and other terrorist groups such as Al Qaeda. They also condemned the recent terror attacks in Pathankot and Gurdaspur in India. On his part, Hollande asserted that “There is no better trust than sharing civil nuclear technology” and hoped that the issues pertaining to the six reactors at Jaitapur nuclear plant will be settled in one year. In pursuance of the 2008 civil nuclear pact, the two leaders encouraged their industrial companies to conclude techno-commercial negotiations by the end of 2016 for the construction of six nuclear power reactor units at Jaitapur the statement said. The negotiations will consider cost viability of the project, economical financing from the French side, collaboration on transfer of technology and cost-effective localisation of manufacturing in India for large and critical components in accord with Government of India’s “Make in India” initiative. “France acknowledged the need for India to have lifetime guarantee of fuel supply and renewed its commitment to reliable, uninterrupted and continued access to nuclear fuel supply throughout the entire lifetime of the plants, as stated in the 2008 bilateral IGA on nuclear cooperation. “The two leaders agreed on a roadmap of cooperation to speed up discussions on the Jaitapur Nuclear Power Project in 2016. Their shared aim is to start the implementation of the project in early 2017. “Both countries reaffirmed their commitment to responsible and sustainable development of civil nuclear energy with highest consideration to safety, security, non-proliferation and environmental protection,” it said. France and India underscored the contribution of nuclear energy to their energy security and to the fight against climate change. France reaffirmed its strong and long standing support for India’s candidacy to the international export control regimes, particularly to the National Security Guard and welcomed India’s decision to ratify the Convention on Supplementary Compensation for Nuclear Damage, the statement said. Describing his visit as “outstanding and exceptional”, Hollande said it was an honour for France and him to be chief guest at the Republic Day. “I commend the action of Modi at the climate change conference. I am aware Modi had potential reluctance at the COP21. He wanted the innovation technology for developing countries to be spread. We owe it to, including Modi for what was achieved at the climate conference, the French president added. Apart from inking IGA for purchase of Rafale jets, the two countries signed 13 agreements cutting across a wide variety of sectors including railways, culture, space, science and technology. 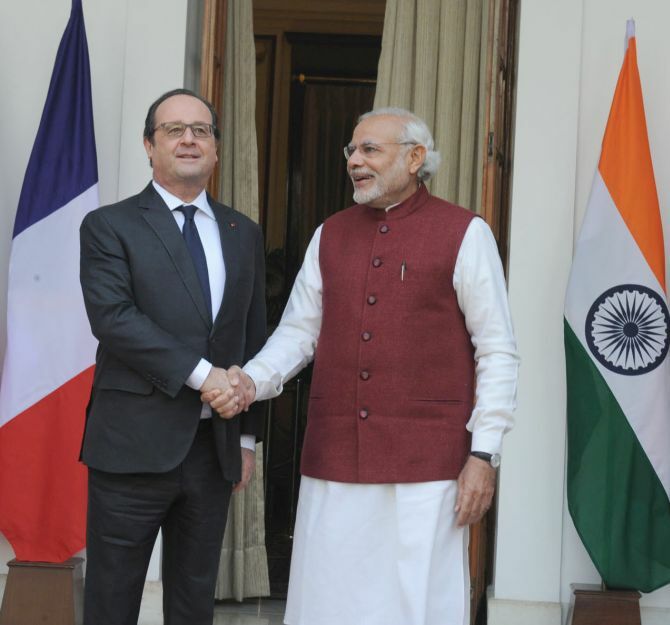 What will India serve Hollande on R-Day? Why are French troops marching down Rajpath?